Our studio is bright and airy and offers a variety of classes to suit all levels of abilities. evening classes enjoy dimmed and candle light practises. The studio is equipped with yoga mats, blocks, bolsters, eye pillows and straps, Pilates balls and bands. Downstairs we have a small studio for private Pilates Reformer sessions. There is also the Peapod Cafe next to the studio, a family friendly restaurant, serving healthy meals, organic and locally sourced. You can also grab a healthy juice or coffee on the go if you haven't got time to stop and eat. Designed for everyone and anyone, RokCore is a calming, serene space specifically designed for a unique Pilates & Yoga practice. Leave your troubles at the door and enjoy some ME time. Unwind, switch off and leave feeling refreshed. We offer a variety Pilates and Yoga classes, for all abilities and levels.Whether you are returning to exercise after injury, looking to improve general mobility and flexibility or looking to build strength and stamina. Our classes aim to help release tension, improve mind - body connection and general well being. We also offer Pregnancy and Postnatal Yoga classes, Mindful Meditation sessions and courses for complete beginners. RokCore Studios was inspired by ownersKatie Ellerbeck & Meera Khalfan. 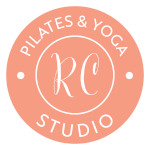 Their vision and passion is to share their love of Pilates and Yoga, with an emphasis on individuals being able to develop their own unique journey, within these practices. RokCore strives to achieve an environment that promotes both physical and mental well - being, without judgements.